AskJeanBlog is a new online resource for people with Celiac Disease, gluten intolerance, dairy intolerance, IBS, Crohn's disease, nursing mothers, heart disease, food allergies, asthma and those with Autism or Aspergers Syndrome following the GFCF diet. AskJeanBlog has recipes, book reviews, hints on baking and cooking, substitutions for traditional foods, doctors tests to ask for (to be diagnosed), a food intolerance quiz, interviews, restaurant reviews and more. AskJeanBlog is chock-full of information to help the recently diagnosed. I've never felt better! Seven chronic problems vanished with this diet. If that's not something to sing about, then what is? While traveling around the country to speak in various venues, Jean Duane, Alternative Cook was asked questions on how to cook and bake, what books to read, what ingredients to use, how to substitute for gluten and dairy, what tests to ask the doctor for, etc. so she decided she could post answers to help people following the gluten-free, dairy-free, GFCF (gluten-free, casein-free), allergy-free diet or low cholesterol. There is so much to know and http://www.askjeanblog.com provides one consolidated online resource. And this blog has a jingle! Alternative Cook has been singing about being gluten-free and dairy-free for several years. Since diagnosed and following this diet/lifestyle, Jean exclaims "I've never felt better! Seven chronic problems vanished with this diet. If that's not something to sing about, then what is?" The jingle makes it easy to remember where to go for help. Currently at http://www.askjeanblog.com are some easy-to-make, delicious recipes on the blog such as sugar cookies, pot pie, fruit cobbler, gluten-free pasta, egg substitutes, milk substitutes and several great summer dishes such as Roasted Sunflower Seed Cabbage Coleslaw and Lentil Leaf Rolls. Recipes are posted regularly. Ingredients used by the gluten-free, dairy-free, allergy-free community are often uncommon. Traditional foods haven't served this community well, so the blog explores new ingredients. Askjeanblog features different ingredients, discusses their properties and how to use them. The DVDs, cookbook and video streams available at http://www.alternativecook.com, show how to use a host of nutritious ingredients to make scrumptious foods that rival foods made with traditional ingredients. The Stocking Your Pantry tab on Askjeanblog enables you to buy all of the ingredients online. This one-stop resource makes it fast and easy to get the hard-to-find ingredients you'll need. Baking and cooking with alternative ingredients can be tricky to achieve the desired textures and tastes. Before writing her recently released cookbook Bake Deliciously! 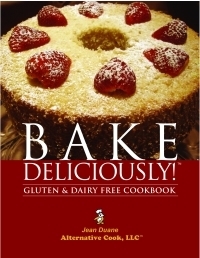 Gluten and Dairy Free with over 150 baked recipes, Jean studied ratios for many basic 'forms' such as cakes, cookies, muffins, quick breads and yeast breads and found a lot of gluten-free recipes use 60-75% highly refined starches. She was determined to develop recipes that were mostly whole grain and therefore more nutritious. Jean shares baking tips she gleaned on the blog. The right appliance makes cooking more fun, fast and easy and you'll find many helpful appliances including a 'gluten-free bread machine' under the tab called Cool Cook's Stuff. The Reading list tab offers many reference books about eating a gluten-free, dairy-free, allergy-free, low cholesterol diet. Book reviews will be featured each month at http://www.askjeanblog.com. The site also refers the visitor to organizations established to help people with heart disease, diabetes, Celiac disease, Autism, Crohn's Disease, IBS, Colitis, food allergies, kidney disease and skin disease - all of which have shown improvement with dietary changes. Askjeanblog has a comprehensive list of links to these organizations for further information. Look for posts several times a week - with recipes, book reviews, interviews, featured foods, restaurant reviews and much more. Subscribe and stay tuned. http://www.askjeanblog.com.